Fire officials are advising people in the southern end of San Francisco to close their windows and doors as a fire burns at a waste collection facility. 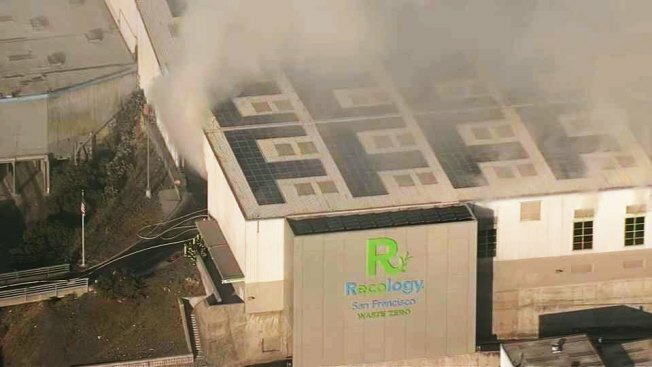 The fire at Recology's Construction Recycling Facility sent a plume of smoke wafting into south San Francisco and over Highway 101 Tuesday morning. The smoke was so bad that Visitacion Valley Middle School decided to cancel classes and send all 400 students home early. The smoke — which carried traces of wood, cardboard and sheet rock — also had firefighters suggesting people stay inside with their windows closed. "It looked like fog, but I smelled it and it was fire smoke," San Francisco resident John Dhanani said. Students at Visitacion Valley Middle School were dismissed for the day due to poor air quality inside and outside the school, according to San Francisco Unified School District. The Bay Area Quality Management District did issue an air quality advisory on Tuesday, saying the smoke may cause minor air quality issues, but no serious health effects. The recycling center is used to sort construction and demolition debris, primarily consisting of wood, sheet rock and scrap metal, Reed said. The center, a metal structure, is not at risk of catching on fire and the building is not used to store any aerosol containers, he said. Earlier Tuesday, Reed said the smoke appeared to be dissipating about 100 feet in the air and was white, so was primarily steam. San Francisco fire officials warned residents in the southern end of the city to keep their doors and windows closed to limit exposure to smoke. Reed said the building, where workers sort material on a conveyer belt, is staffed 24 hours a day and Recology took action quickly. The San Mateo County Fire Department responded to the fire. San Francisco firefighters took over responsibility for the incident at 1 p.m.